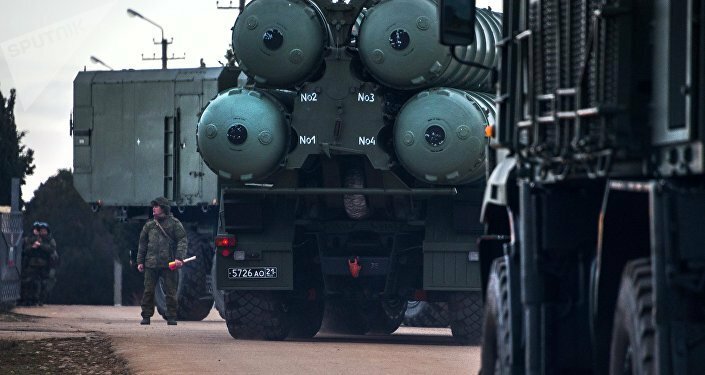 MOSCOW (Sputnik) - Ankara dismissed Washington's threat of sanctions and demand to cancel the purchase of Russian-manufactured S-400 air defense systems during recent talks in Washington, at the same time expressing its readiness to take the latter's security concerns into account, Hurriyet reported on Thursday, citing diplomatic sources. According to the Hurriyet newspaper, the issue of the S-400 purchase was also raised during the meeting between Foreign Minister Mevlut Cavusoglu with his US counterpart Mike Pompeo in Washington on June 4. The newspaper noted that Washington had warned Ankara that it could trigger sanctions on Turkey if the latter did not heed its demand. In December, Russia and Turkey signed a loan agreement for supplying S-400 air defense systems to Ankara. US officials have repeatedly said that Washington is seeking to discourage Turkey from contacts with the Russian defense sector, which is a target of US sanctions. Washington opposed the deal for three main reasons, the media outlet noted. First, the deal went against NATO's plans to further isolate and deter Russia. Secondly, there were concerns that the system’s deployment in Turkey would endanger the flights of NATO aircraft. Lastly, it went against US commercial plans to promote the purchase of US-made Patriot air defense systems. President Donald Trump reportedly sought to convince his counterpart Recep Tayyip Erdogan that Washington was ready to sell Patriots to Ankara, expressing regret that the previous administrations used to put obstacles to such deals with Turkey. Turkish officials reportedly strongly rejected Washington’s calls, insisting that these systems would be bought and deployed since the country needed them. They also warned their US counterparts that any sanctions against Turkey would not be left without a response. Ankara, however, expressed its readiness to jointly look into potential consequences of deploying S-400s, stressing that it had chosen a 19-month delivery instead of a quicker option, so that the systems could operate under Ankara’s full control. "If we had accepted a nine-month delivery option then we would have no control over the use of S-400s. They would be used only by Russian experts, as national software would not be ready to be uploaded. Instead, we have chosen the 19-month option so that we could prepare our technical works and use them under fully Turkish control. We are very sensitive on this," the Turkish officials said during the talks, as quoted by the newspaper's sources. In August 2017, US President Donald Trump signed the Countering America’s Adversaries Through Sanctions Act (CAATSA) into law. The legislation allows the United States to impose sanctions on entities and individuals that operate on behalf of Russia's defense or intelligence sectors, as well as those engaging in transactions with these sectors.